Are you looking for a student-centered project for your Psychology class? 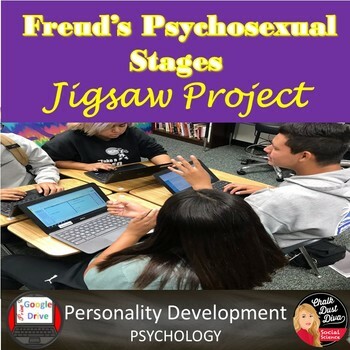 In this digital jigsaw project your students will be divided into groups to research and share the Freud’s Psychosexual stages of the Psychoanalytic theory of personality. Each student will use the Google slides template to complete one slide for the project. To follow my store simply click on “follow me” under Chalk Dust Diva on the top of my store page. You will be the first to receive notifications when I post new products and have sales. Pay with a Purchase Order! At checkout, click edit if you need more than one product. You can purchase additional classroom licenses at a reduced cost. Then, click on checkout. At the top, click on the Purchase Order tab. Follow instructions for the P.O. TpT will save your order and when the P.O. is received, your downloads will be available for you on the website. You will receive an email that will let you know when payment has been received. Don’t forget to leave feedback after you purchase a product! Leaving feedback also earns you "credits" which can be used for discounts on future purchases. I would very much appreciate your positive feedback!